Asparagus | Batta bing, batta blog! Most days I’m not the adventurous type when it comes to making dinner. I prefer tried and true recipes that I know I can’t mess up yet still taste good. However, after hosting Easter dinner this past weekend, I was left with a lot of leftover items in my refrigerator. David and I have been trying to get much better about about our grocery budget, spending less on food in general but also being more careful to use what we have and not waste a bunch of perfectly good food. Tonight I decided I was going to be creative. Take what was in my refrigerator and make it work. I forewarned David that he would be a guinea pig when he got home. I told him if it was awful we would head to Chipotle. It was a deal. 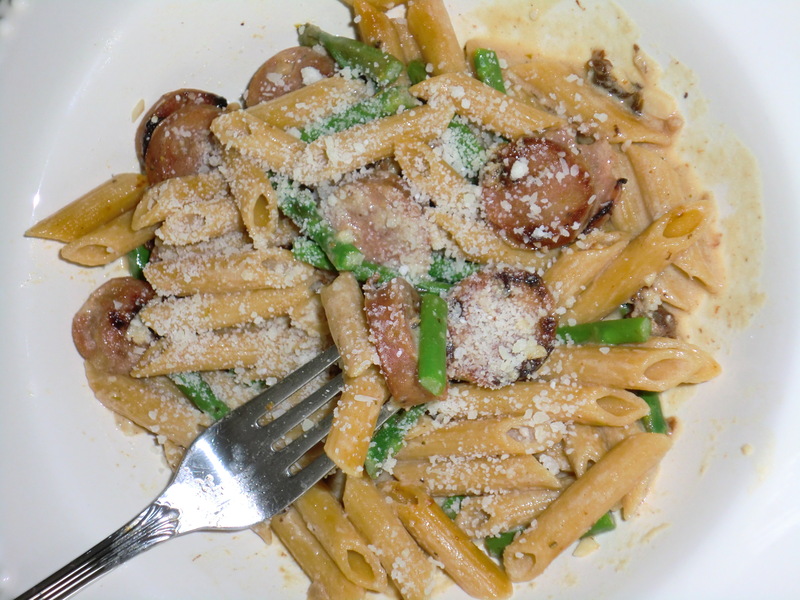 I was going to make a pasta and it was going to have chicken apple sausage, asparagus, and white wine in it. The rest was to be determined. I’m pleased to share this wonderful healthy recipe. It turned out so well it’s most certainly blog worthy!! Unfortunately I didn’t know it was going to be as good as it was so I don’t have step by step pictures. This together so easily and was so light yet incredibly flavorful! The white wine added a great depth of flavor. 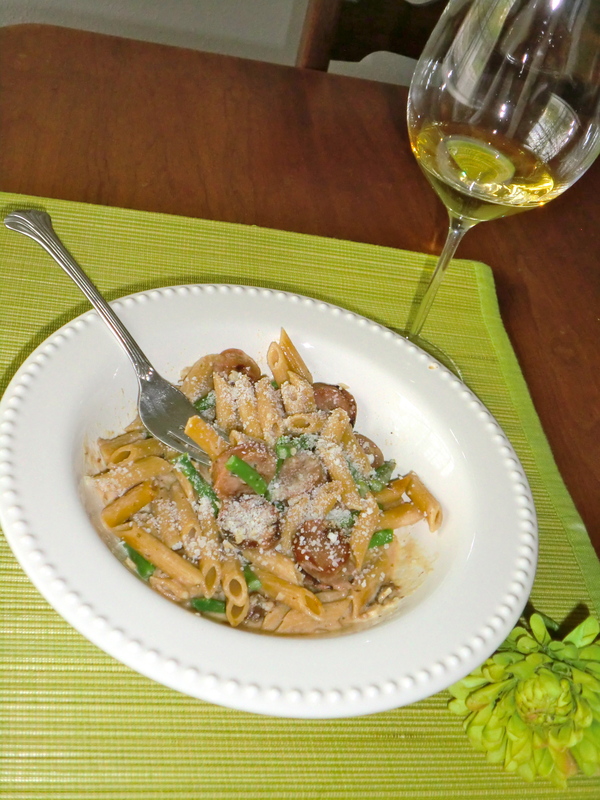 This is a perfect dish for a beautiful spring night. 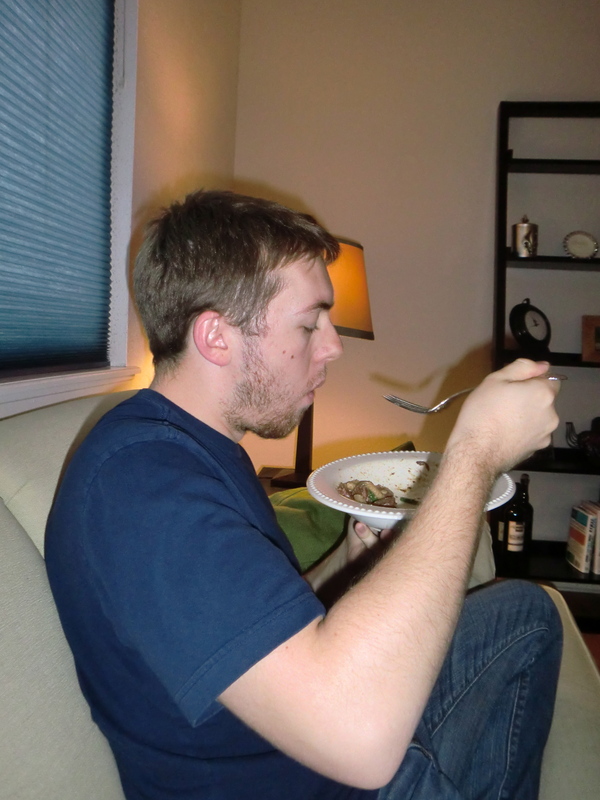 To prove that this was a success I thought I would share a picture of David chowing down. He loved it, he had seconds and look forward to the leftovers for lunch!